The NF-A14 is a premium quality quiet 140mm fan with a square frame that complies with Noctua’s AAO (Advanced Acoustic Optimisation) standard. Its square shape and 140mm mounting holes (124.5mm spacing) make it ideal for use on watercooling radiators or as an upgrade for 140mm case fans. Featuring sophisticated aerodynamic design measures such as Flow Acceleration Channels, the NF-A14 further improves the renowned quiet cooling performance of the award-winning NF-P14. The FLX version provides 1200/1050/900rpm speed settings via the supplied Low-Noise Adaptors in order to provide full flexibility in fine-tuning the fan for maximum ventilation performance or near-silent operation. Its superb running smoothness, reference-class SSO2 bearing and Noctua’s trusted premium quality make it an elite choice for the highest demands. Noctua's NF-P14 fan has become a default-choice among PC enthusiasts looking for a premium quality quiet 140mm fan. Thanks to its thoroughgoing aerodynamic optimisations, the NF-A14 provides higher static pressure and an even better airflow/noise ratio than its much acclaimed predecessor. The NF-A14's square 140mm frame with 140mm mounting holes (124.5mm spacing) makes it a premium grade replacement for common 140mm case fans and perfect for use on 140mm water cooling radiators, where its square shape will ensure full coverage and best pressure performance. The NF-A14 impeller features suction side Flow Acceleration Channels. By speeding up the airflow at the crucial outer blade regions, this measure reduces suction side flow separation and thus leads to better efficiency and lower vortex noise. The NF-A14 features the further optimised second generation of Noctua's renowned, time-tested SSO bearing. With SSO2, the rear magnet is placed closer to the axis to provide even better stabilisation, precision and durability. In order to guarantee the highest possible degree of manufacturing precision, minimum tolerance and excellent long-term stability, the NF-A14 sports a CNC milled bearing shell made entirely from brass. The latest version of Noctua's advanced Smooth Commutation Drive system ensures superb running smoothness by eliminating torque variations and switching noises. This makes the NF-A14 remarkably quiet even at very close distances. Providing 1200, 1050 and 900 rpm speed settings via the supplied Low-Noise and Ultra-Low-Noise Adaptors, the NF-A14 FLX (Flexibility) can be fine-tuned for superior airflow or maximum quietness. The fan's short 20cm primary cable minimises cable clutter in typical applications while the supplied 30cm extension provides extended reach when necessary. Both cables are fully sleeved and the supplied 3:4 pin adaptor allows the connection of the fan directly to the power supply. Despite of its further improved performance, the NF-A14 FLX consumes only 0.96W of power, which amounts to a reduction of about 20% as compared to its predecessor. This doesn't only make it eco-friendly but also helps to cut down the electricity bill! Noctua fans are renowned for their impeccable quality and outstanding longevity. Like all Noctua fans, the NF-A14 features an MTTF of more than 150.000 hours rating and comes with a full 6-year manufacturer's warranty. In questa recensione ci siamo realmente resi conto di quanto Noctua sia attenta ai dettagli e alla cura dei propri prodotti anche in delle “semplici” ventole che poi, in questo caso specifico, semplici non sono visto l’elevata cura nella produzione e nelle tecnologie adottate. Ci ha stupito moltissimo il fatto di ritrovare tutte le tecnologie citate nell’introduzione anche nelle ventole di dimensione ridotta come le NF-A4. Siamo decisamente soddisfatti sia dalle prestazioni in termini di efficienza/rumore, sia dal bundle che dai prezzi decisamente in linea con quelli di altri produttori ma assolutamente superiori in termini di caratteristiche e prestazioni. Attribuiamo a tutta la NF-A Series il premio Gold Award per l’innovazione tecnologica e la cura dei particolari che L’azienda ha dimostrato in questa serie di ventole super-efficienti. Tras probar las serie NF-A de 140mm podemos decir que estamos ante cuatro grandes ventiladores, en general silenciosos y con un buen caudal aire. De la serie NF-A14 tenemos el modelo FLX que es silencioso y mueve un buen caudal de aire. El modelo ULN es el más silencioso de los analizados, es inaudible aunque su caudal no es excesivamente alto pero suficiente para refrigerar nuestra torre. El modelo PWM es silencioso eso si, a máximas revoluciones empieza a sonar algo más, moviendo un gran caudal de aire. De la serie NF-A15 el modelo PWM es el que más caudal mueve de los cuatro modelos analizados, a máximas rpm ya suena algo pero es normal debido al gran flujo de aire que genera. Concluimos que son ventiladores muy similares, cuyas diferencias son la velocidad de rotación. El modelo ULN está especialmente diseñado como ventilador auxiliar por su baja sonoridad. El modelo NF-A14 FLX destaca por ser silencioso y tener un buen rendimiento, pudiendo regularle las rpm mediante los adaptadores que incluye. El modelo NF-A14 PWM destaca por ofrecer un gran rendimiento regulando las rpm forma automática. Y el modelo NF-A15 PWN que tiene la particularidad de que dispone agujeros de montaje de 120mm, destacando su gran caudal de aire y sonoridad. Comme d'habitude chez Noctua les nuisances sonores sont très basses, ils sont tous inaudibles à 5v et se font entendre à 12v, à part pour le ULN qui lui reste quasiment inaudible même à fond! Les ventilateurs produisent tous un son grave (comme tous ceux de la marque) qui n'est pas gênant et les moteurs sont dépourvus de bruits parasites, un très bon point. Im Einsatz zeigen die neuen Noctua-Lüfter dann sofort und nahezu uneingeschränkt ihre Stärken. Schon nach wenigen Sekunden ist klar, das sich die Geräuschemissionen des schon vom Werk aus recht leisen Nanoxia Deep Silence 1, noch weiter senken lassen. Als wäre dies nicht genug, lassen sich die beiden NF-S12A, wie auch der NF-A14 in ihrer Arbeitsgeschwindigkeit leicht nach unten korrigieren, ohne dabei an Performance, in diesem Fall Kühlleistung bzw. Luftdurchsatz, zu verlieren. Ein klares Zeichen, das Noctua mit der dritten Generation seiner NF-Lüfter, doch noch einen, wenn auch nur kleinen Schritt nach vorn machen konnte und im Premium-Segment nicht nur bei der Ausstattung, sondern auch der Leistung weiterhin Maßstäbe setzen kann. Ebenfalls lobenswert ist das breite Drehzahlband, welches von den NF-Lüftern abgedeckt wird. Die Spanne reicht hier, fein gestaffelt, von einer Anlaufgeschwindigkeit knapp unterhalb von 600 U/min. (ca. 50 %), bis hin zu leistungsorientierten 1200 U/min. (100 %). Noctua has devoted itself to quiet cooling. In that they have succeeded well. One measure of their insistence on quietness was their not bringing PWM products to market until they were ready to do it the Noctua way. “Fans” of Noctua’s fans long wrote about how they wanted PWM versions, yet there were no PWM fans from Noctua. But it turned out that Noctua was not ignoring PWM; their engineers were working on developing a silent PWM control. The clicking seen in other PWM fans – even quiet clicking – is completely absent in Noctua PWM fans. This started with their NF-F12’s, and has now extended to their A series. All are clickless. As well as can be measured in a non-professional setup, Noctua’s airflow specifications are accurate. You can listen to a fan and hear if it is quiet or not, and whether it makes unpleasant noises (Noctua fans are free of unpleasant noises). But airflow is another matter. Airflow takes special instruments to measure. It is comforting to know Noctua’s specifications on this are accurate; so you can use those specifications in your buying decisions. 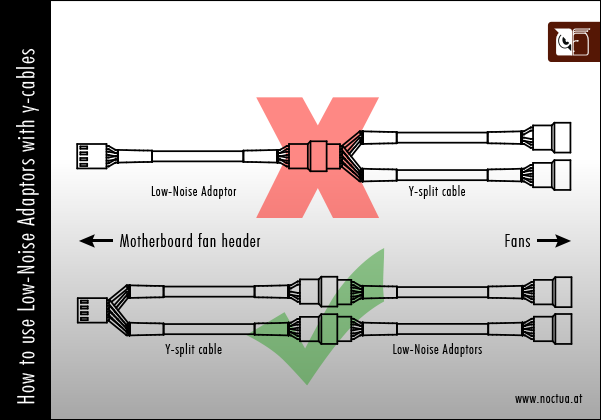 The various Low Noise Adapters and Ultra Low Noise Adapters are different for each of the fans. Clearly, they are tailored to achieve particular results. This may or may not be unique to Noctua fans. Interestingly, Noctua says nothing about it. The Noctua accessories are of good quality, and appear likely to last in extended usage. They are all handsomely sleeved as well. The fan frames are sturdy, and the corner cushions do not extend into the screw holes. That means the fans can be securely fastened with or without the cushions. Keep in mind that while the test results aren't overwhelmingly spectacular, consumers are offered more options depending on what they're looking for. The Noctua NF-P14 was a "convertible" fan. It had 120mm hole spacings with 140mm extensions with a round frame, so it could fit 120mm or 140mm mounts However, like a real convertible with the top down, it's a bit louder. Round framed fans in general perform much better on air cooling radiators, but square framed fans in general perform better on watercooling radiators. Thus, you now have the option to choose between a variety of 140mm (and 150mm) fans from Noctua. Whether you're looking for the most optimal silent solution with the NF-A14 ULN, or a quieter replacement to the NF-P14 with the NF-A14 FLX that still does a great job with the U.L.N.A. adapter. The NF-P14 is still a solid performer and the NF-A15 PWM is a great replacement for 120mm fans where size isn't a factor. Decisions, decisions! Noctua's NF A-15 PWW, A-14 FLX, and the A14 ULN are a welcome addition to their lineup of cooling products. The NF-A15 PWM and the NF-A14 FLX run at 1200rpm when not equipped with the low noise adapters. This of course improves their overall performance at the cost of increased noise output from the fans. I am not saying they generate a lot of noise - as a matter of fact even at their maximum rotational speeds the fans are are extremely quiet, almost to the point that I continued to check just to make sure they actually were in operation. The NF-A14 ULN without a doubt generates the least amount of noise with or without the low noise adapter. [...] Noctua's NF-A15 PWM, NF-A14 FLX, and the NF-A14 ULN are priced around $24.00 each; a reasonable price considering the quality and performance of the fans (not to mention a 6 year warranty). In my book, that's a lot of bang for the buck. The NF-A14 FLX is obviously the most versatile fan in the lineup, and it performed very well in each of the configurations it was put into. On the X60 radiator, temperatures were very close to the stock fans that were spinning a full 50% faster, thanks to the NF-A’s high static pressure, and the NF-A14 FLX made a drastic difference in the noise levels of the X60. Noise levels were way down, and the X60 was a far more livable piece using the NF-A14 FLX. Mounted as case fans, the NF-A14 FLX moved considerably more air than the stock case fans, keeping temperatures down while showing no increase noise. At slower speeds, the NF-A14 FLX was incredibly quiet while still exhibiting excellent airflow. [...] Noctua has again put out a series of absolutely top notch fans with the NF-A 140mm varieties. The versatility of the offerings should offer up something for the needs of just about any situation, ranging from extreme cooling to extreme silence. As always, Noctua’s build quality is second to none with performance to match. So in short, what can I say… The NF-A15 and NF-A14 cooling fans are proper Noctua quality with added new innovations. With every new design they unveil, Noctua brings out great airflow with minimal noise and are extremely reliable (I still use 5 year old Noctua fans). They are a bit more expensive than typical case fans but are worth every penny. Questa nuova serie, che verrà analizzata in modo superficiale in questo capitolo, rappresenta la volontà di Noctua di potenziare e consolidare la propria situazione nel panorama delle ventole aventi un diametro molto elevato, infatti a seguito dell’immissione in commercio di questi modelli si è raggiunto il completamento dell’offerta per ogni settore. La serie ULN e FLX da 140mm si caratterizza per il nuovo telaio AAO introdotto con l’eccellente ventola da 120mm NF-F12 Focused Flow, recensita da noi tempo fa (Qui), e per il cambiamento del formato da circolare a quadrato, oltre a tutta la nuova serie di migliorie tecniche e strutturali che sono già state menzionate nel capitolo precedente. L’intera serie “A” infatti presenta quasi sempre le medesime caratteristiche tecniche, indipendentemente da modello e dal diametro, per cui la qualità complessiva è sempre molto elevata. Which Noctua 140mm fans are optimised for airflow, which are optimised for static pressure? How much torque should be used for fan screws? 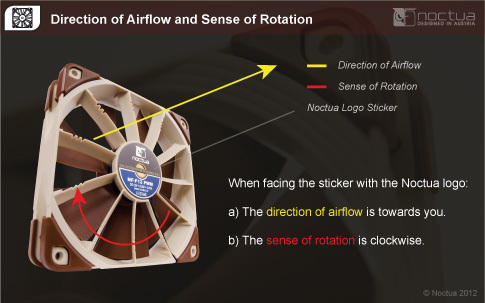 Can I use Noctua fans in my system from Acer, Apple, Dell, HP, Lenovo or other major brands? Can I use Low-Noise Adaptors with y-cables / multiple fans? How should I clean my Noctua fan? How can I find out the direction of airflow and sense of rotation? What pin configuration do Noctua 12V fans use? Can I paint my Noctua fan in order to change its color? Can I disassemble my fan for cleaning (or other purposes, e.g. painting)? Can I run Noctua 3-pin fans on 4-pin PWM connectors and use my mainboard’s automatic fan controller? My Noctua 3-pin fan starts to spin when the PC boots but then stops, what is wrong? Noctua only distinguishes between airflow optimised and pressure optimised fans in its 120mm range (see this page for details). For 140mm fans, there is no such distinction: Both the NF-A14 and the NF-P14 redux models are true all-rounders that provide outstanding levels of airflow and static pressure. Either of them works excellent both for case cooling and for use on radiators and heatsinks. Please use 0.6Nm to tighten fan screws. Make sure not to overtighten the screws as this may damage the fan frame. Noctua 12V fans comply with the established specifications for standard PC systems issued by Intel and AMD. Systems from Acer, Apple, Dell, HP, Lenovo or other major brands often deviate from these specifications e.g. by using proprietary fan headers, custom pin-alignments or pin-configurations, different methods of fan speed control, etc. This can lead to compatibility issues when using Noctua fans in systems from said brands. Some of these problems can be avoided with some technical knowledge, but especially BIOS related issues (e.g. errors or shutdowns due to low fan speed) can often not be resolved. As a result, Noctua does not officially support systems from Acer, Apple, Dell, HP, Lenovo or other major brands. Yes, Low-Noise Adaptors (L.N.A.s) can be used with y-cables, but please make sure to use one L.N.A. per fan and to place the L.N.A.s between the y-cable and the fans as shown below. Never use one L.N.A. for two (or more fans) by placing it between the mainboard and the y-cable! Fans inside computer cases tend to accumulate dust over longer periods of usage. In order to maintain maximum performance, please clean your fans regularly using a duster, slightly moist tissue or canned air. Please be careful not to use too much force in order to prevent any damage to the fan. Please do not use a vacuum cleaner as this may apply excessive force to the fan and do not put the fan under running water as water residues inside the motor may lead to short circuits. In order to ensure flawless operation over many years of usage, Noctua’s premium grade SSO bearings are fully sealed to prevent the entering of fine dust particles. Please note that the fan is not designed to be taken apart by the user. Removing the impeller from the frame will break the sealing of the bearing and results in a loss of warranty. Since even small variations in the layer of paint can lead to an imbalance of the impeller, resulting in vibrations, higher noise levels, increased stress on the bearing and thus reduced lifespan, we do not recommend painting the fan. Please note that for the reasons stated above, painting the fan will void your warranty. In order to ensure flawless operation over many years of usage, all Noctua fans come with a premium grade SSO bearing, which is fully sealed to prevent the entering of fine dust particles. Please note that the fan is not designed to be taken apart by the user. Removing the impeller from the frame will break the sealing of the bearing and results in a loss of warranty. It is thus recommended to clean your fans using a duster, slightly moist tissue or canned air. Please be careful not to use too much force in order to prevent any damage to the fan. Please don’t use a vacuum cleaner as this may apply excessive force to the fan. 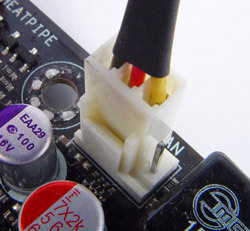 You can simply connect our fan's 3-pin connector to the 4-pin PWM sockets of today's mainboards so that the fourth pin that transmits the PWM signal is left blank (due to the shape of the connector, there's no danger of reversing polarity). Some mainboards (e.g. 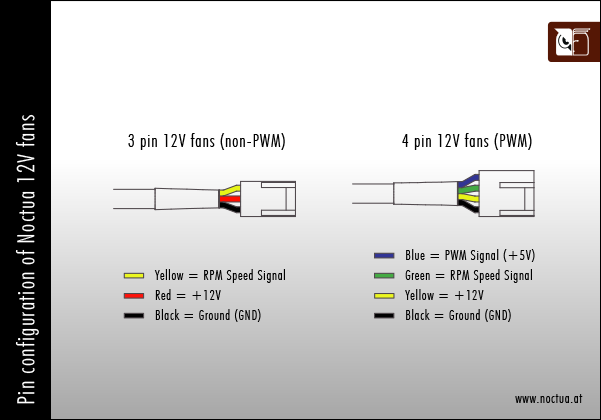 current Gigabyte models) are capable of controlling fans not only via PWM, but also by adjusting the supplied voltage. In some cases, this may require you to change BIOS options like "Fan Control Mode" from "PWM" to "Voltage" or "Analog". Please consult your mainboard's manual in this regard. 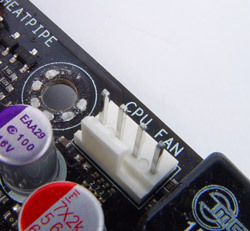 However, some mainboards use an "auto" setting by default that automatically chooses PWM or voltage based regulation according to the connected fan. Automatically controlling the fan speed may not possible on mainboards that pulse the power rather than lowering the fan voltage.